To prove it's going big in PCs, Acer held a product launch event at world's largest IMAX screen in New York City. It made a big statement with the Predator Triton 700, a super-thin laptop with some unusual features. At first glance, the Triton 700 looks like any other thin gaming laptop. The surprises start when you open it up. The keyboard and touchpad trade locations. The keyboard is placed at the bottom, while the extended touchpad is above it. The oversized touchpad is also transparent, giving a glimpse into cooling components of the laptop, like its unique AeroBlade cooling fan. That design was inspired by transparent gaming desktops, and it is something gamers will love, said Eric Ackerson, senior product and marketing manager at Acer. Acer could've made more parts of the laptop transparent, but some U.S. Federal Communications Commission regulations allowed only a limited part of the touchpad and laptop to be transparent, Ackerson said. Using the transparent touchpad, which is made of Gorilla Glass, felt a little strange. It took a few minutes to get oriented with the idea of using a trackpad over a keyboard. The trackpad uses the standard multitouch features of Windows 10, which can be customized for games. With the location of the Triton 700 keyboard, I didn't have to worry about mistakenly hitting the touchpad with my palm, which happens often on my Dell XPS 13. Reversing the location of the keyboard and trackpad is an interesting experiment, and made me wonder if this trend could catch on in other laptops. Changing decades of laptop-using habits is certainly an ambitious idea. But the feature is mainly targeted toward gamers who use mice for gaming,Â Ackerson said. But using the Triton 700 transparent touchpad on a daily basis could be a challenge, as I found out with further experimentation. I had to keep my palm floating in the air when using the touchpad. Just for testing, I dropped my palm, and it hit a bunch of keys on the keyboard. I'm assuming that if Notepad or Word were running, a barrage of characters would have shown up in those applications. Given the placement, it would also be impossible to use a thumb on a Triton 700 trackpad, which I do regularly on my XPS 13. The thumb is mostly out of reach of the trackpad. But by using my other fingers on the touchpad, I could use my thumb on the keyboard, which actually worked fairly well. I couldn't test a game with the Triton 700 trackpad because none was loaded. But it was extremely comfortable to use with regular Windows applications -- like with drag and drop and double-clicking to load applications. The larger touchpad canvas makes it easy to move the pointer around the screen, and I can see benefits in gaming, because gamers won't have to squish their fingers into the usually smaller spaces of touchpads on other laptops. The laptop itself was fantastic. It weighed 2.6 kilograms and could be held with one hand (though it felt weighty) -- and that's an achievement in gaming laptops. 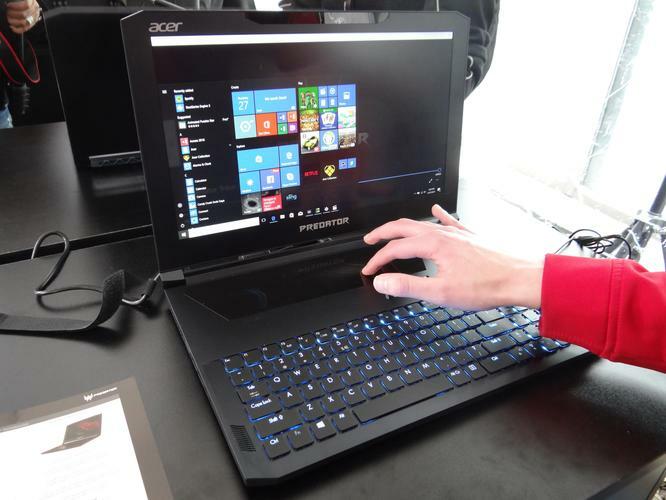 At 18.9 millimeters thick, Acer boasted that the Triton 700 was among the thinnest gaming laptops, outperforming the 2016 Razer Blade and rivals. But the Triton 700 price is pretty fat. It will start shipping in August and is priced at starting at US$2,999 for the U.S. market and âŹ3,399 for the Europe, Middle East and Africa markets. It offers a 15.6-inch high-definition display, up to 32GB of DDR4 DRAM, and up to 512GB of storage. It can be configured with either an Intel Core i7-7700HQ or a Core i5-7300HQ CPUs, and with Nvidia's GeForce GeForce 10-series GPUs. Also tucked into the laptop are one Thunderbolt 3 port, two USB 3.0 slots, one HDMI port, and a DisplayPort connector. It has Killer 2x2 802.11ac Wi-Fi and also a gigabit ethernet port. In the rush of crowds waiting to test and photograph the laptop, I couldn't do detailed benchmarking of the laptop. Acer claimed a 3DMark score of 17,000, outperforming laptops in its class. The true benchmark scores will come when independent testers get ahold of it. In an eye test, a high-definition video played smoothly, and the speakers were booming. But for its size and build, the Triton 700 looks great. It may take time to get used to the touchpad, but its thinness and light design are also attractions. The company didn't say if they'd bring out another version of the laptop, with the keyboard and touchpad placed where they should be, but I wouldn't be surprised if it did.